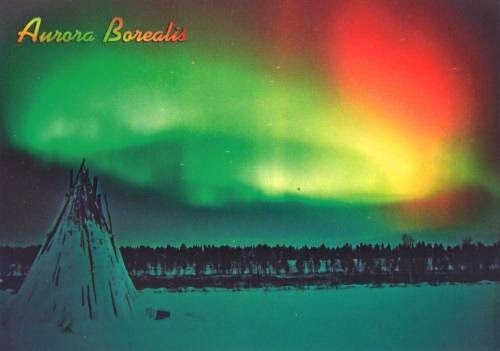 Postcard FI-2125042 from Finland shows a spectacular view of the northern lights or aurora borealis, a natural light display in the sky usually seen in the high latitude area near Arctic, caused by charged particles from a solar storm entering Earth's magnetic field and causing the excitation of the neutral particles and consequent optical emissions. Last Tuesday on March 17, 2015, a much stronger than usual solar storm hit Earth and created massive colorful northern lights. As a result, the auroral zones expanded southward, pushing auroral displays as far south as Kansas and Virginia in the United States.